Tropical depression. Strong easterly winds. Anchored between two much bigger boats. To prepare, yesterday we replaced the folding anchor, which did not dig in and had slipped on the sandy ground, with the delta plough anchor with 8m chain and 30m line. It held solidly with the motor running full speed backwards. Just to be safe we placed a second Danforth Anchor Radek had lent us, also with plenty of rope. We were very confident that this would enable Magayon to weather the storm. December 29, 2109, Pandan Island. 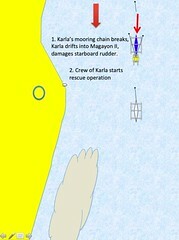 Karla’s mooring broke at 11:00 on December 29 in the heavy wind caused by the tropical depression. 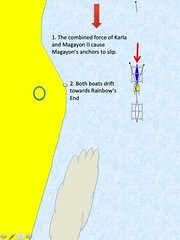 Karla smashed into Magayon II and dragged her, the two anchors could not hold the added force of the much bigger boat. As we found out later the Danfort anchor broke under the load. 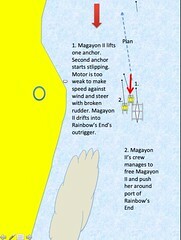 When Karla got free from Magayon II by her crew and left for shelter in Sablayan, Magayon II was very close (3m) to Rainow’s End. 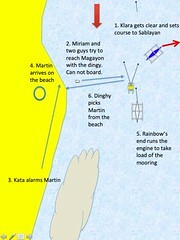 While all this happened, Magayon’s crew was ashore. Martin was taking a nap in the cottage when Kata came screaming, “Dad, Magayon!!!”. When Martin arrived at the scene, Miriam was already on the dinghy joining two guys going out to the anchor grounds. Gael started swimming out too and Martin wondered whether he should do the same but then the dinghy came back for him. The high waves prevented us from getting close so we asked the helmsman to bring us upwinds ahead of the bow of Magayon, where we dropped into the sea and swam over. With Gael, Miriam and Martin on board we were now three on the boat and could start the rescue operation. 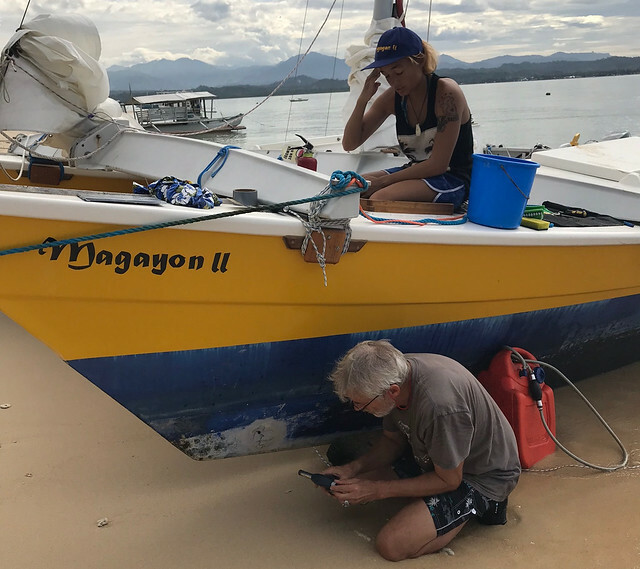 Miriam started the motor and Martin got the third anchor, the folding anchor we had rejected earlier because it slipped on sand, ready for moving Magayon II away from Rainbow’s End, further upwinds. A quick inspection revealed that the top of the port rudder was was broken off. We had to remove the port tiller and the tiller connection rod, and had only control over the starboard rudder. We would have to steer with the engine, seriously reducing forward thrust when doing so. Martin managed to raise the Danfort anchor. Then the remaining anchor started slipping, the 8hp engine did not have enough power to hold the boat in the strong wind and at the same time use it for steering. The broken rudder was a serious problem. We drifted drifted into Rainbow’s End and got caught in her outrigger. 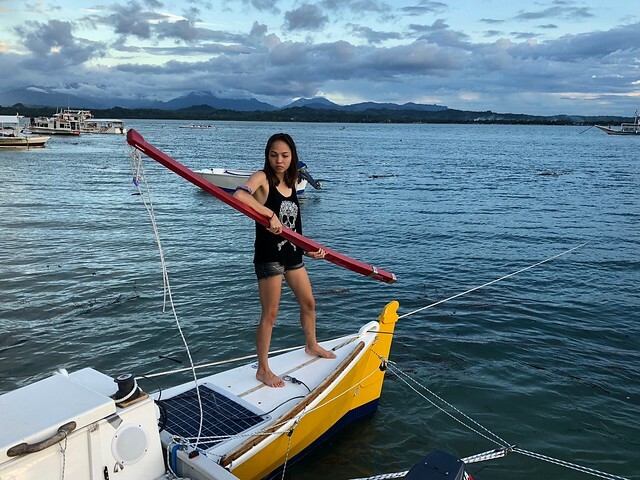 With combined muscle power we managed to free Magayon II and push her around Rainbow’s End’s outrigger and then tried to set course to to the beach with the motor running on full power. We did not want to take the risk to get upwind of Rainbow’s End again, which we would have to if we tried to raise the anchor, so we let the anchor line go. We could recover that later. Two anchors left on board, one broken and the other one not holding well on sandy ground. Not too good. Another reason to go for the beach. 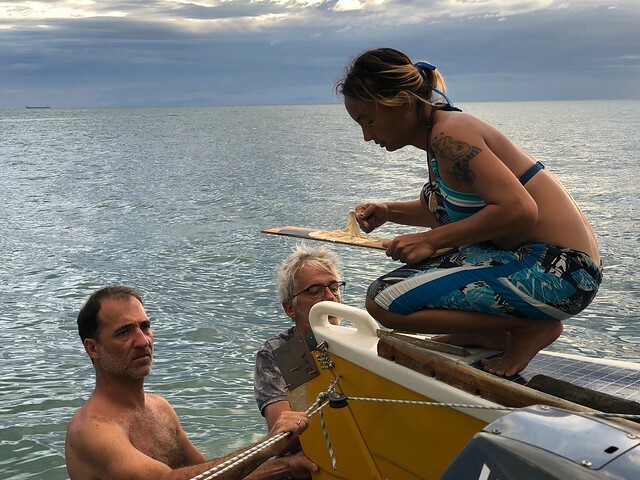 With Miriam steering with the motor and Martin supporting with the remaining starboard rudder we managed to slowly approach the beach, but lost a lot of height getting closer to the house reef. And then the bow went through the wind and could not go back even with full revs and motor set to full port. Tacking was impossible. Martin thought quickly about going to the open sea and set course to Sablayan port because that is more protected from the wind and waves. 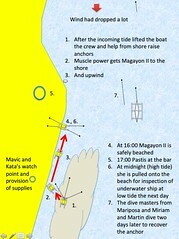 But then decided against it because he was not sure how manoeuvrable Magayon II would be on high sea with only one rudder. We therefore made another quick decision and tried to jibe and get back on course towards the beach. 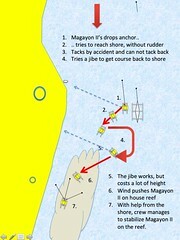 The jibe worked but we ended up loosing too much height and were getting quickly towards the house reef. Martin again thought about sailing to open sea but too much winds for sailing and the broken rudder and unreliable engine were no good prospect. We had to reach the beach somehow. 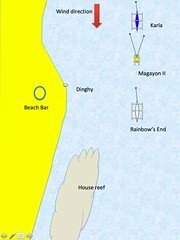 So we ended up on the house reef. 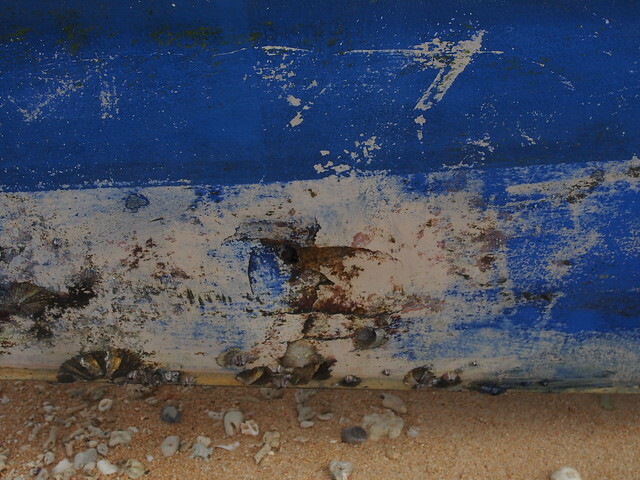 The poor boat hit corals with every wave. Martin was about to give up hope that we could rescue her. We tried to stabilise her using the Danford Anchor and the folding anchor, which we had dropped immediately after getting on the reef. 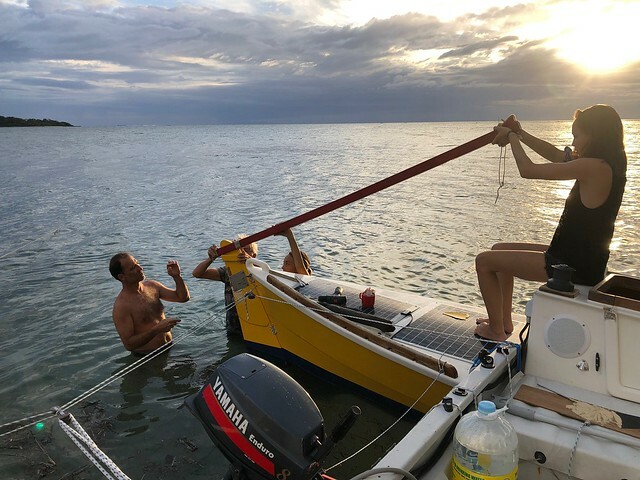 With help of Kata, Alix, Gael, Radek, Francesco, and many guests and staff we managed to stabilise the boat in a deeper area with fewer corals. Now she was hitting a coral only occasionally. Radek brought an additional anchor from the dinghy and we could stabilise her with anchors to three sides. Martin and Miriam stayed on board to wait out the low tide and to adjust the anchor lines when needed. Mavic set up an observation point on the beach and Kata brought lunch in the form of egg and ham sandwiches from the restaurant and some drinks. So far the day has been dry, but now it started drizzling a bit and made the situation even more miserable. Martin tested the VHF radio doing a status check call with Radek, and got tide times from him. So far so good. We had survived and Magayon II might too. We occasionally checked the water level by observing a rock on the beach that slowly got covered with water. Two hours later the high tide was coming in and had raised the water level about 30cm, the rain had stopped and the wind had dropped. Time to get the boat to the beach. 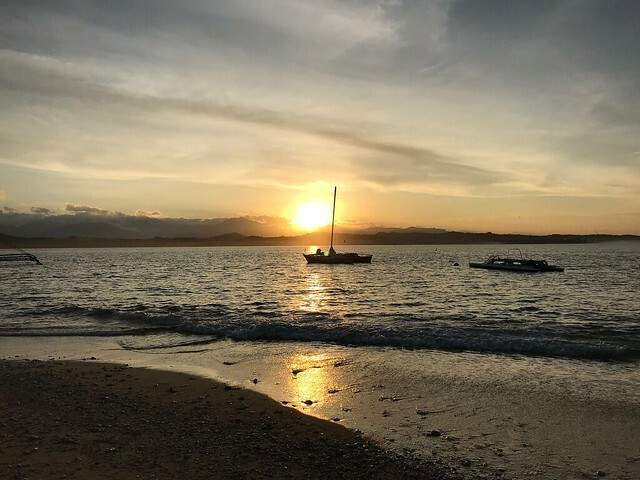 With the help of many guests and staff from the resort and dive shop we managed to drag her to the shore, recover the anchors and transfer her to a safer part of the beach. Time for some drinks at the bar, and dinner. At midnight at high tide we dragged her as high as possible onto the beach to let her fall dry with the low tide. Tomorrow at around 10:00 in the morning would be low tide, time for the inspection of potential damage. Port rudder broken off on top. Tiller connection rod, eye broken out on port end. Collision damage on port hull, aft. Both solar panels on port hull damaged. Hole in port hull, bow, port side. In first compartment. We needed a plan for the repairs. 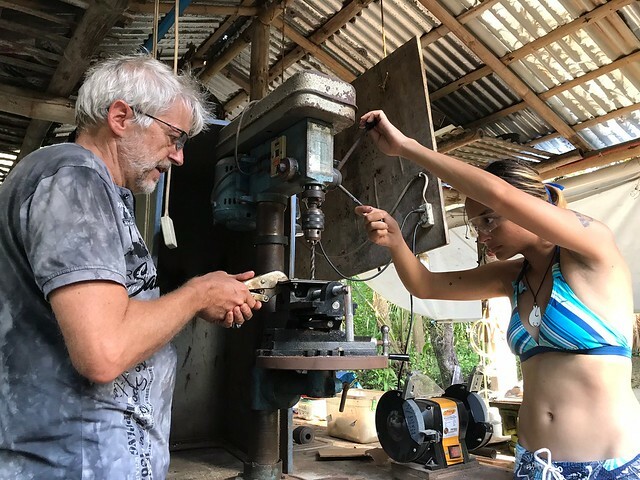 Martin and Mavic went to Sablayan to buy repair supplies and in the afternoon the crew, with help from Jean, repaired the rudder using two stainless steel plates, 6 bolts and nuts and a lot of marine epoxy. Mariposa’s workshop came in handy for the repairs. It is fully equipped with all the tools one might need and a lot of helping hands. We pre-fabricated the stainless steel enforcements in the workshop and then went to work on the boat to fix the rudder. For this Martin had bought a long wanted toy, a BOSCH cordless drill. This morning at low tide (10:00) we went to work and fixed the hole in the port bow. 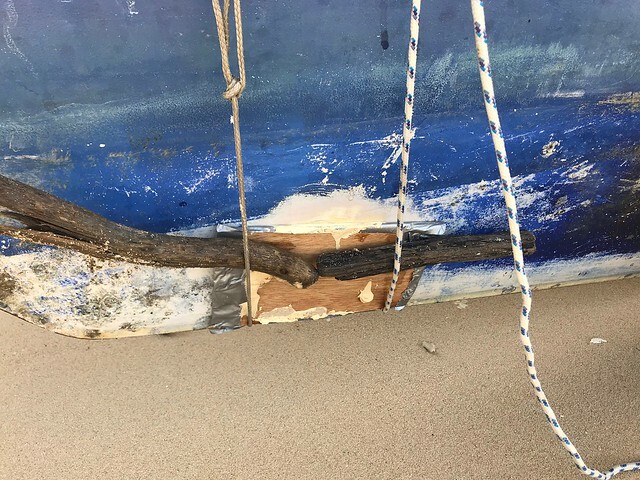 Water had entered the compartment twice, and after it drained through the hole, the splintered plywood underneath the fiberglass cover was soggy. Kata went to the Resort to get the blowtorch. “Give it to her, and give her anything else she needs.” Said the resort co-owner, eager to help after the unlucky events of the previous days. Time to fix the hole. Martin opened up the hole a bit more to get to plywood that was less splintered and cleaned the wood as good as possible. A fuel tank served as wave breaker to avoid the wood getting splashed on by incoming waves. While the girls secured the perimeter with Magayon’s fire extinguishers, Martin dried the plywood with the blowtorch. Yes, a fuel tank and a blow torch don’t go together well, but with all this water around…. After the wood was reasonably dry Chemist Kata was put in charge mixing big batches of marine epoxy. The first batch we used to press it between the wood and the fiberglass to fill some of the splinter gaps. The second batch to fill the hole completely. 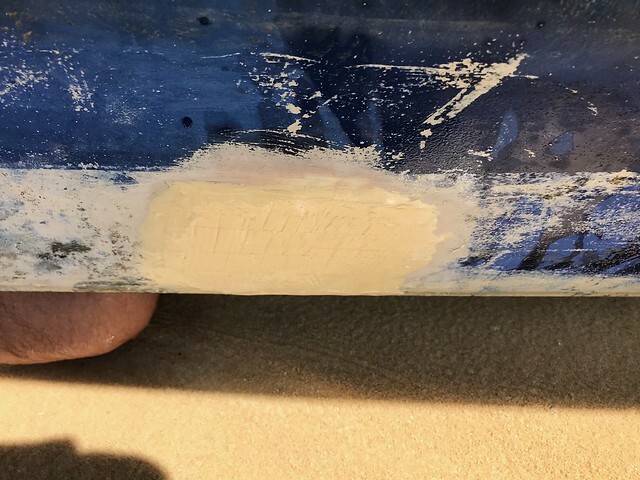 A plywood board covered with duct tape (I don’t believe in many things but I do believe in duct tape) and towed against the epoxy to keep it in shape until it was cured. Two hours later and with the plywood removed, a better than expected repair patch appears. Last thing to repair was hole that needed to be drilled in the tiller connection rod which we had repaired with marine epoxy too. Magayon is ready to sail again. We have time for some luxury repairs and make a new port aft cleat. 14:00: Gael‘s and Alix‘ attempt to find our anchor using scuba gear failed. Too murky and maybe they looked in the wrong spot. We prepare ourselves to do a dive too, but tomorrow. Happy New Year Hangover day after fantastic New Year party. Traditionally Mariposa Dive Shop is closed this day. We had asked yesterday whether we could borrow some dive equipment today or whether the diveshop would be closed. “Do you see any doors?” had been Anthony’s response. So Miriam and Martin did a Search and Recovery dive with dive gear from Mariposa Dive shop. We found the anchor rope on 18m after a zigzag dive downwind starting from Rainbows End. We attached two water bottles to the end of the rope and filled them with air. We then followed the rope and loosened the anchor, which was dug in well. We then went back ashore and went for the bottles on Bawayak. After finding them we retrieved the anchor, one water bottle exploded when Martin tried to open it. We would not have found the anchor without the two previous dives more upwind by Alix and the dive masters from Mariposa because we would have looked in the wrong position. 16:00. With the anchor recovered there was no reason to keep the boat on the beach. We moved her back to the anchoring grounds and dropped the Anchor at around 6m depth. Stopped the Motor. Just to be safe, dropped the second anchor too. The depth sensor is still broken. It showed 14 m depth where we anchored.